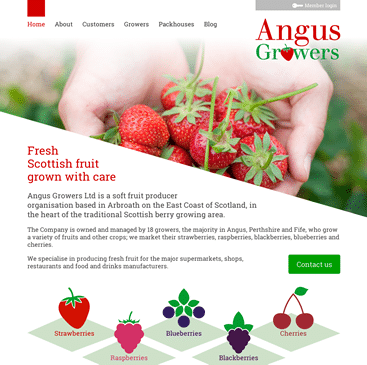 Angus Growers are a soft fruit farmers cooperative based on the east coast of Scotland. They have members from Fife to Aberdeenshire and pack and market the growers fruit collectively to obtain better prices with major buyers like supermarkets and food producers. The brief was to raise the profile of the growers to help give a sense that the food comes from real people, and is grown in the UK. We designed a number of candidates and the growers themselves had a vote to choose the winner. The final logo features a strawberry as it is the most popular fruit grown, but we also created fun variants for raspberries, blackberries, blueberries & cherries. We carried the logo and website branding through to a business card design for each of the AG staff. To allow grower data to be presented in different ways – like a map, or a list of growers for a specific fruit – we created a simple database of growers that Angus Growers populated. They found the process of adding data and keeping it up to date much easier than they’d originally thought. The website highlights the growers and the fruit they grow. Finally we migrated the Angus Growers intranet over to the new server and ensured it was accessible from the main site for authorised users.